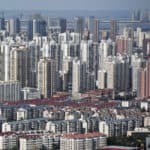 The number of mainland cities seeing new home prices rise dropped to 44 in February from 50 the previous month, according to the latest figures from China’s National Bureau of Statistics, as demand suppression measures decreed by the government continued to shut down deals in the country’s most popular urban areas. Out of the 70 cities tracked, prices dropped in 16 cities month on month including first-tier cities Beijing, Shanghai, Guangzhou and Shenzhen. It was these top-tier cities which saw the most significant decline in prices. Shenzhen had its biggest drop in three quarters as prices slid 0.6 percent from the previous year. Prices fell 0.4 percent in Guangzhou, 0.3 percent in Beijing and 0.2 percent in Shanghai, compared to the same period last year. “The data has given indication that the control measures have some effects on the housing market, with fewer cities seeing prices going up — even the range of increase is not as huge as before,” said David Ji, Head of Research & Consultancy for Greater China at Knight Frank in a phone interview with Mingtiandi. Ji expects that there will be downward pressure on new-home prices across the board althoug control measures are likely to be less severe for cities with excessive stocks. “Given the fact that the congress session has finished, the policy direction will be clear. The current policy trend will continue. We wouldn’t see drastic ups and downs in home prices. Growth will be at a single-digit pace,” Ji said. Despite the slowing price growth, China’s residential property investment grew at the fastest rate in three years during the first two months of 2018 since 2014, according to data released by the National Bureau of Statistics last week. Total investment in residential property in the period of January and February this year amounted to RMB 738 billion ($117 billion) — a growth of 12.3 percent year on year. The rate is the highest since the same period in 2014. Housing sales by developers also grew during the period, with total receipts climbing by 15.3 percent during January and February, although the area of floor space grew by only 4.1 percent.